Welcome to “The ARRL Letter” update from Big Island ARRL News. Accessed on 05 April 2019, 0615 UTC, Post 923. The initial announcements are set for the period from April 20 – May 3, which coincides with the “Vital Connection” interoperability exercise to be held in Wisconsin. Future time slots will coincide with the Vital Connection exercise Ohio in June; DOD COMEX 19-3 in August, and the DOD COMEX 19-4 in October. Following the proof of concept this year, DOD anticipates making use of the WWV/WWVH broadcast time slot full-time, year-round. The FCC is accepting comments on a Petition for Rule Making (RM-11831) seeking to amend FCC Part 97 rules that require all ham radio digital transmissions to use techniques “whose technical characteristics have been documented publicly.” The Petition, filed by Ron Kolarik, K0IDT, of Lincoln, Nebraska, expresses concerns that some currently used digital modes are not readily and freely able to be decoded, and it asks the FCC to require all digital codes to use protocols that “can be monitored in [their] entirety by third parties with freely available, open-source software,” per Â§97.113(a)(4). Kolarik said his petition also aims to reduce levels of amateur-to-amateur interference from Automated Controlled Digital Stations (ACDS) on HF operating under Â§97.221(c)(2). Kolarik wants the FCC to delete Â§97.221(c), which permits automatic control of digital emissions provided the station “is responding to interrogation by a station under local or remote control, and [n]o transmission from the automatically controlled station occupies a bandwidth of more than 500 Hz.” The petition does not call for eliminating ACDS, however. Under current rules, ACDS are allowed in specific sub-bands. The Petition also proposes to amend Â§97.309(a)(4) to ease monitoring of certain digital transmissions. “Without open, over-the-air interception capability for all transmissions in the Amateur Radio spectrum, there is no way to determine if there is commercial or other prohibited, inappropriate content in ongoing communications…” Kolarik’s Petition asserts. He said problems arise when “protocols and devices used in commercial, government, and marine services are used in the Amateur Service with no adequate means to fully decode transmissions,” thwarting any efforts at self-policing of such transmissions. He said simplifying the language “would remove ambiguity about what constitutes ‘publicly documented technical characteristics’ by requiring any protocol to be freely decodable,” and lead to “amateur digital mode transparency, present and future.” Read more. The FCC has also placed three other Amateur Radio-related Petitions for Rule Making (PRMs) on public notice and has invited comments. Jerry Oxendine, K4KWH, of Gastonia, North Carolina, wants the FCC to clarify that state and localities should have no authority to regulate Amateur Radio with respect to enacting “distracted driving” statutes. 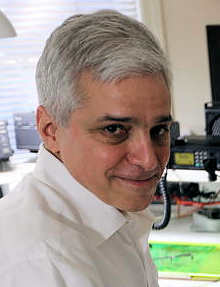 In his Petition for Rule Making, now designated as RM-11833, Oxendine contends that such statutes violate FCC rules on scope and operation of equipment by licensees; violate the intent of the FCC and Congress with respect to Amateur Radio’s role in disasters, and hinder emergency operations using mobile equipment. “There is no evidence that the operation of two-way radio has but an insignificant impact on ‘distracted driving,'” Oxendine stated. “I see no reason for a licensee to have to compete with out-of-area people for the few 1 Ã 2 or 2 Ã 1 or catchy 2 Ã 3 call signs available in their area of residence,” Borghi told the FCC. Jeffrey Bail, NT1K, of West Springfield, Massachusetts, has submitted a very similar Petition, now designated as RM-11835, asking that the FCC give residential preference in competing applications to applicants whose listed FCC address is within the same district/region as the applied call sign. He cites limited availability and increased demand for 1 Ã 2 and 2 Ã 1 call signs. Read more. “Covering the Rules on Calling CQ” is the focus of the new (April 4) episode of the “So Now What?” podcast for Amateur Radio newcomers. If you’re a newly licensed Amateur Radio operator, chances are you have lots of questions. This biweekly podcast has answers! “So Now What?” offers insights from those who’ve been just where you are now. New episodes will be posted every other Thursday, alternating new-episode weeks with the “ARRL The Doctor is In” podcast. Listeners can find “So Now What?” on Apple iTunes, Blubrry, Stitcher(free registration required, or browse the site as a guest) and through the free Stitcher app for iOS, Kindle, or Android devices. Episodes will be archived on the ARRL website. ARRL will be well represented at the annual National Association of Broadcasters (NAB) Convention, April 6 – 11, in Las Vegas. ARRL CEO Howard Michel, WB2ITX, and Communications Content Producer (and co-host of ARRL’s new podcast, “So Now What?”) Michelle Patnode, W3MVP, will be attending. Nevada Section ARRL volunteers, under the guidance of Section Manager John Bigley, N7UR, will be on hand to greet visitors at the ARRL booth (#LN1). Those tending the ARRL exhibit will offer information on how to get involved in ham radio, become an ARRL member, and take advantage of ARRL services. They’ll also offer information on licensing, operating activities, and other topics. The NAB show draws hundreds of hams involved with media, technology, and entertainment, and features nearly 1,700 exhibitors and numerous workshops and classes. The NAB show also features the Amateur Radio Operators Reception, co-sponsored by Turner Engineering, Inc., and Nemal Electronics, Wednesday, April 10, 6 – 8 PM at the Westgate Las Vegas Resort and Casino. The event offers a relaxed evening of discussing broadcasting-related matters, camaraderie, and prizes (including ARRL publications). Heather Flewelling, WH6FTQ, recently had the honor of lending her name to a newly spotted comet. 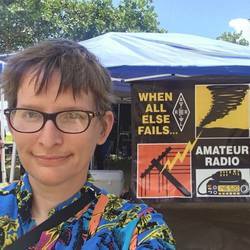 A planetary defense researcher, Flewelling is a relatively new ham who upgraded to Amateur Extra class at ARRL Field Day 2018. She was working on an asteroid impact early warning system being developed by the University of Hawaii’s Institute for Astronomy, funded by NASA, when she saw the comet. The International Astronomical Union (IAU) Minor Planet Center designated Comet Flewelling (Comet 2019 D1) on March 21. “I’m a new ham (not yet a year),” Flewelling told ARRL. “I never knew it would be such a fun and exciting year for me!” Flewelling just began working in a small group, called the Asteroid Terrestrial-Impact Last Alert System (ATLAS). Its two 0.5-meter telescopes are dedicated to surveying the sky and finding near-Earth asteroids. “We occasionally find comets, and, in certain circumstances, you can get one named after you. You have to be first to report it, and it needs to be a new, unknown comet,” she explained. Flewelling is quite active on VHF/UHF, and she enjoys hiking and Summits on the Air activations. “I’ve helped out multiple times for SKYWARNactivations, and I’m one of the net controls for the daily net on the local repeaters here. I’m starting to get my station together for HF, but it’s tricky, and I’m cheap, and I desperately want whatever I do to be the cheapest, weirdest, why-would-you-do-that solution,” she said. One of her greatest accomplishments is working with her team to create the Pan-STARRS1 astronomical database, the world’s largest. Flewelling’s background is in physics, and she holds a PhD in that discipline from the University of Michigan. “Ham radio is a hobby I should have gotten into years ago,” she said on her QRZ.com profile. “As a kid, I would build crazy antennas at my mom’s house, in order to pick up ‘far away’ FM broadcast stations and TV stations. I don’t think I heard about ham radio until I was an adult, and then a combination of either lack of time or lack of money prevented me from getting into the hobby.” She said an inexpensive SDR she purchased on the internet and the availability of “cheap” radios is what finally got her into Amateur Radio. Tad Cook, K7RA, Seattle, reports: Sunspots have been coming and going lately, and this week they returned. No sunspots were seen January 31 – March 4, March 13 – 17, or March 25 – 30. They returned on March 31 and have been visible every day since. The average daily sunspot number declined from 16 to 9.4 over the reporting week. Average daily solar flux dropped from 75.2 to 69.5. Average daily planetary A index rose from 3.7 to 8.4, while average middle latitude A index went from 3.9 to 7.3. Predicted solar flux is 70 on April 4 – 6; 72 on April 7 – 10; 70, 69, and 69 on April 11 – 13; 70 on April 14 – 22; 69, 68, 69, and 69 on April 23 – 26; 70 on April 27 – May 7; 69 on May 8 – 10, and 70 on May 11 – 18. Predicted planetary A index is 12, 10, 10, 12, and 8 on April 4 – 8; 5 on April 9 – 11; 15 and 8 on April 12 – 13; 5 on April 14 – 23; 10, 8, 5, 8, 10, and 8 on April 24 – 29; 10 on April 30 – May 1; 8 on May 2 – 3; 10 on May 4; 5 on May 5 – 8; 15 and 8 on May 9 – 10, and 5 on May 11 – 18. Sunspot numbers for March 28 – April 3 were 0, 0, 0, 14, 17, 18, and 17, with a mean of 16. The 10.7-centimeter flux was 68.4, 68.8, 69.4, 69.5, 69.3, 70.8, and 70.6, with a mean of 75.2. Estimated planetary A indices were 11, 7, 4, 11, 8, 6, and 12, with a mean of 3.7. Middle latitude A index was 10, 6, 3, 9, 6, 5, and 12, with a mean of 3.9. In the second session, NHC Assistant Amateur Radio Coordinator Julio Ripoll, WD4R, will discuss operations of the Center’s WX4NHC. 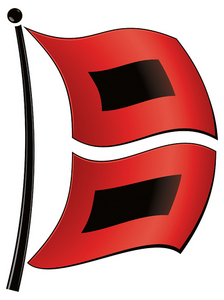 Hurricane Watch Net (HWN) Manager Bobby Graves, KB5HAV, will be on hand to explain how the HWN functions in hurricane response situations. He’ll also talk about personal weather stations and back-up power. ARRL Eastern Massachusetts Section Emergency Coordinator Rob Macedo, KD1CY, will talk about the VoIP Hurricane Net and best practices in SKYWARN for tropical systems. National Salvation Army Team Emergency Radio Network (SATERN) Liaison Bill Feist, WB8BZH, will describe SATERN and its health-and-welfare role in hurricanes. Plans call for all Amateur Radio recording and live-streaming all presentations via YouTube. Visit www.nsradio.org/stream or on the VoIPWX Net website for details. Read more. On April 12, ARRL will conduct its next Frequency Measuring Test (FMT), a tradition that dates back to 1931. In that era, prospective participants were promised “a pleasant and profitable experience” and advised that taking part in the FMT would be a form of insurance against out-of-band operation “and the unpleasant consequences that follow.” Official Observers and Official Relay Stations were required to participate in the FMT or offer a very good excuse. W1MK — the predecessor to W1AW — was one of a dozen or so transmitting stations. The 80- and 40-meter frequencies were confirmed through an arrangement with the US Department of Commerce Radio Division. Accurate frequency measurement — at least to the degree that radio amateurs rarely worry about operating outside of an amateur allocation — is now almost a given. But today’s FMT leaders are able to accurately measure beyond the number of decimal places (out to five) a typical transceiver will display. FMT announcements may conjure visions of a vast array of sophisticated laboratory equipment. While some of the most successful stations did have laboratory-grade gear, others got quite close with far less. FMTs take place in April and November. The November 2018 FMT results are available on the ARRL website. Connie Marshall, K5CM, offers information on his website on how to measure the frequency of a carrier. Articles in QST have also covered this topic. The April 2019 FMT will get under way at 0200 – 0225 UTC on April 12. The 40-meter frequency will be in the vicinity of 7065 kHz, and the 80-meter frequency will be in the vicinity of 3599 kHz. Details are on page 94 of the April 2019 issue of QST. With the completion of several major tasks, including establishment of the ARESÂ®Plan, a standard set of principles and guidelines for emergency preparedness volunteers, and the launch of the ARES Connect volunteer database management program, two original PSEWG members have stepped down. Joining the PSEWG is Northwestern Division Vice Director Mark Tharp, KB7HDX, who assumes the seat held by Pacific Division Director James Tiemstra, K6JAT, who has been appointed to the ARRL Executive Committee. Another original PSEWG member, past Northwestern Division Director Jim Pace, K7CEX, opted not to run for re-election this past year and has retired from the group. Issues the PSEWG is expected to tackle in the months ahead include developing a system for collaboration between ARES and the National Traffic System (NTS); updating the ARRL EC-001 and EC-016 courses; rolling out an ARES Task Book Review, and updating the ARRL Ham Aid Deployment Policy. Read more. Robert B. “Bob” Famiglio, K3RF, of Media, Pennsylvania, is once again the ARRL Atlantic Division Vice Director. 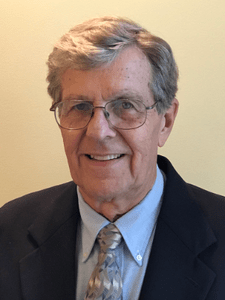 Famiglio, an attorney, was appointed by ARRL President Rick Roderick, K5UR, to fill the vacancy left by the departure of Riley Hollingsworth, K4ZDH. He will serve with Atlantic Division Director Tom Abernethy, W3TOM. Famiglio, who was initially Atlantic Division Vice Director from 2015 until 2017, is a past Eastern Pennsylvania Section Manager and is an ARRL Volunteer Counsel. He served as a District Emergency Coordinator from 2006 until 2011. Licensed since 1967, Famiglio is also an electrical engineer and former broadcast station owner and engineer. He is an FAA-certificated pilot and a Life Member of the Institute of Electrical & Electronic Engineers (IEEE). The beat goes on in IARU Region 1. The International Amateur Radio Union Region 1 (IARU R1) Monitoring Service (IARUMS) reports that intruding interference continuing from the Russian “Kontayner” over-the-horizon (OTH) radar. IARUMS reported that this radar “caused severe problems on 14 MHz,” sometimes with three signals active at the same time — each with 14 kHz bandwidth and much splatter. The OTH radar is located north of Penza, Russia. German telecommunications authorities have filed an official complaint. IARUMS reports that 80 meters in Region 3 is crowded with “Sunflower” OTH coastal radars. On 40 meters, an OTH radar is reported on 7,003 kHz, Russian CW beacons in the vicinity of 7,039 kHz, and Radio Eritrea on 7,140 and 7,180 kHz. According to Dean (KH6B) and Barbara (NH7FY), there will be a ham radio breakfast on Saturday, 09 April 2019, 0800 HST, at the Lava Rock Cafe in Volcano Village, Hawaii Island. Doug Wilson (KH6DQ) continues his series of free Technician License classes on Hawaii Island. Here are the upcoming classes: 6:30 p.m., 19 April 2019, at Discovery Harbor in Ka’u; 23 May 2019 in Waimea (location pending); and 17 October 2019 at the Keaau Community Center. For details, contact Doug at douscelle@aol.com. According to Pacific Section Manager Joseph Speroni (AH0A), the new ARRL EMCOMM course (EC-001) will be offered to Hawaii Island radio amateurs beginning in June 2019. Joe adds that “The new EC-001 course addresses Hawaii’s situation as an island state.” Once the Hawaii Island course begins, the new EMCOMM course “will be rolled out throughout the Pacific Section as quickly as local mentors become available.” To register for the course, please send an email to Clem Jung (KH7HO0 at kh7ho@arrl.net.